When restored, vintage Brussels lace veils and vintage veils trimmed with Chantilly, Alençon, and other types of lace are lovely with today’s bridal gowns. Most vintage lace is made from sturdy cotton that can be safely returned to the true color. Point de Gaze (also called Rosepoint) and Duchesse, for example, nearly always restore beautifully. 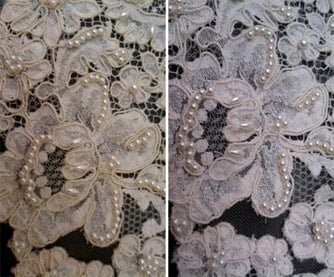 Some vintage lace is appliquéd onto silk illusion, which is often too fragile for restoration, but the lace can be restored and then sewn onto nylon or polyester net. Not all brides choose to wear the original bridal tiara that is attached to the veil. You may prefer to remove the tiara from the veil and attach the restored veil to a comb. Or you may ask us to remove the lace from the tiara, restore it, and create a new ornament from the restored lace. If you would like to honor a family member by including a treasured wedding accessory in your wedding, let us remove the ugly brown stains and yellowing from your vintage veil, ring pillow, or wedding pouch. Although not every vintage bridal veil, ring pillow, or wedding pouch can be restored, we can usually predict whether the project will be successful, and there is never a charge for evaluation. Bring your vintage wedding accessories to a Certified Wedding Gown Specialist™ near you. This beautiful vintage veil was attached to a comb and looks lovely with a new gown.